Facebook/Cassie Watson13-year-old Ali Chaney, left, and the message allegedly sent by a local teacher. Last month, Texas 13-year-old Ali Chaney made headlines when school officials deemed her pro-LGBT t-shirt inappropriate for school. Now, her story has taken a strange new turn in light of the mass shooting at an Orlando nightclub last weekend, Yahoo Style reports. On May 23, Chaney wore a t-shirt to school that read “Some people are gay. 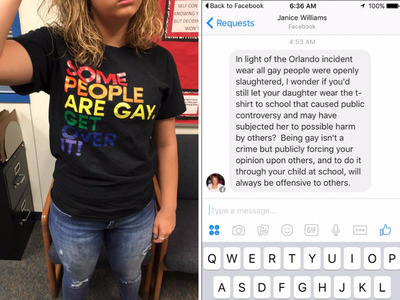 Get over it.” She was quickly summoned to the principal’s office and told that the shirt would not be tolerated, Chaney’s mother Cassie Watson wrote in a Facebook post. Then, on Monday, June 13, the day after the Orlando massacre, Watson posted a new development on Facebook: A screenshot of a message that was apparently sent from the Facebook account of a local elementary school teacher. In it, the teacher asks Watson whether she would still let her daughter wear the t-shirt to school in light of the Orlando mass shooting, suggesting that Chaney could be the next victim of anti-gay violence. A rep for Facebook told Yahoo that the company doesn’t comment on the status of individual accounts. Watson responded to the claims, telling KCEN she did not believe the teacher’s account had been hacked. For now, the mystery behind the message remains unresolved.